The 1986 decision by the majority of Provisional Sinn Féin to abolish abstentionism meant that the party was now one that would be actively involved in the political affairs of the state. The general elections of the late 1980s and 1990s showed the impact of this change: more candidates were being put forward than there had been in decades, and as time progressed, some candidates began to poll very well. 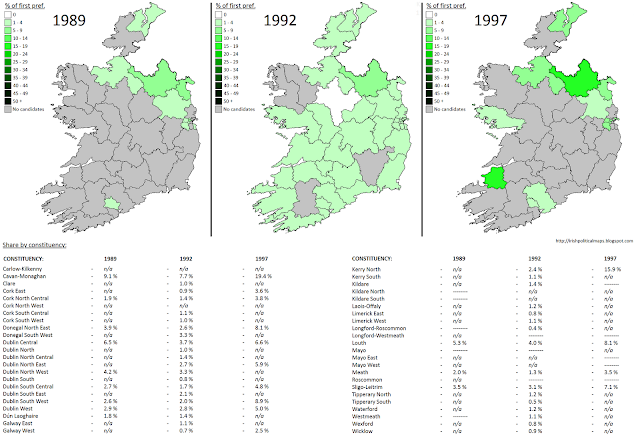 The 1989 general election was mainly contested in south-west Dublin and in border constituencies. No candidate received more than 9.1% of the vote. The 1990s would see further changes for Sinn Féin as the peace process began to move forward. In 1994 the Provisional IRA declared a ceasefire, which was broken in 1996 and renewed permanently a year later. Prior to these developments, a general election was held in 1992, which saw a a huge increase in the number of Sinn Féin candidates compared to previous elections. Only four constituencies were without a Sinn Féin candidate, but despite this increased exposure, the party's shares remained much the same as they had three years before. The highest-polling candidate was, as in 1989, Cavan-Monaghan's Caoimhghín Ó Caoláin - though he polled 1.4% less than last time. Despite running in nearly every part of the state, Sinn Féin was still a distance away from actually winning seats. The renewal of the ceasefire in 1997 paved the way for talks which ultimately led to the Good Friday Agreement, which restored power-sharing in Northern Ireland and put a tentative end to the Troubles. Sinn Féin's new commitment to achieving their aims through the democratic process was initially met with scepticism by many, but the change in attitude did return some electoral rewards for the party . The 1997 general election in the Republic saw Sinn Féin win their first seat since 1957 - the new TD being an increasingly popular Ó Caoláin, who topped the poll at 19.4%. As well as being the first Sinn Féin TD in 40 years, Ó Caoláin was the first to sit in Dáil Éireann since the 1921 split over the Anglo-Irish treaty. Another strong candidate was Michael Ferris in Kerry North, though he came just short of winning a seat. Sinn Féin did not repeat their strategy of running a candidate in most constituencies in 1997, instead running candidates only in areas where their vote was strong and where good support could be established and expanded upon in other areas. The party continued to use this tactic throughout the 2000s. 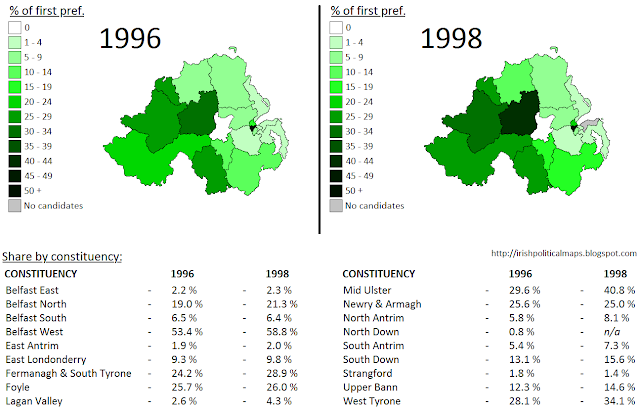 In Northern Ireland, the fortunes of Sinn Féin likewise increased as the peace process developed. 1996 saw the first general election in 14 years, which saw Sinn Féin's overall vote increase by 5% from 1982. This election was for the Northern Ireland Forum, an important part of the negotiations for the Good Friday Agreement. The successful restoration of power-sharing resulted in a new election two years later. Elected MLAs (Members of the Legislative Assembly) would sit at the new Northern Ireland Assembly in Stormont. Sinn Féin's vote increased to almost 17%, and the party came just over 3,000 votes short of surpassing the DUP as Northern Ireland's third largest party. The party's largest gains were of course in traditional nationalist areas. These gains increased substantially in some parts in the two years, particularly in Tyrone and south Down. These increases would continue in the next decade, with Sinn Féin eclipsing the SDLP as the leading nationalist party in 2003.